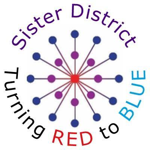 Here's a really good presentation of Sister District's strategy by 2 of its founders (Rita Bosworth and Gaby Goldstein) at the March 9, 2019 meeting of Sister District Marin. Learn why it is so important to work on state races if you want to save our Democracy! Well worth a watch! Connect with Sister District West County here on Facebook. Sister Districts 2019-2020 Strategy Video - Plug in with local Sister District Group!